With just days left before summer ends, kids and parents aren’t the only people who are watching the calendar closely. The back-to-school season is one of the most important retail events of the year with every business from the big box to your favourite indy clothing store banking on the collective need for new backpacks, binders, jeans and laptops to dramatically drive up sales. All the hype surrounding the season makes it tempting to blow the family budget. Spending associated with school-related items has been on the rise in Canada in recent years, with the results of several polls suggesting no reversal to that trend in sight. The one exception is a recent Leger survey conducted on behalf of C.S.T. Consultants, an Registered Education Savings Plans provider. The online poll found that almost half (47 per cent) of Canadian parents surveyed with children under 18 are aiming to spend less than $200 per child on back-to-school items. Moms proved particularly thrifty, with one-third of those surveyed budgeting as little as $100 per child. Most parents, 79 per cent, said they felt no particular pressure to overspend to prep their kids for school. Even more, 85 per cent, said they’d rather save their money in order to help pay for their children's costly university years. The results are surprising given conflicting data coming in from other sources, and certainly not what retailers want to hear. But to Peter Lewis, C.S.T. vice president, it's good news. The way he reads it, the survey indicates more parents are awakening to the reality of the need to sock money for the day when their kid(s) head off to university or college. “There is a lot of pressure put on parents by kids to spend money, along with everything else, but it seems like there are lots of folks who are prioritizing savings,” Lewis said. Seriously, though, just how committed are we really when it comes to saving for the future? The same report found us to be on track this year to outstrip the previous year's spending total. January to February sales in Canada reached $68 billion — 4.3 per cent above the 2013 mark. According to Statistics Canada, retail sales of clothing and accessories, including jewelry, luggage and shoes, surged 3.8 per cent in June compared to May 2014, with a whopping year-over-year increase of 9.9 per cent. An annual survey of parents conducted by BMO Bank of Montreal also suggests we're spending more to prep our kids for the classroom. Last year's BMO poll found that Canadians intended to spend an average of $428 per child on school supplies, clothing and technology related to school. That's an increase of 18.2 per cent over 2012, when parents planned to spend an average of $362 per child. 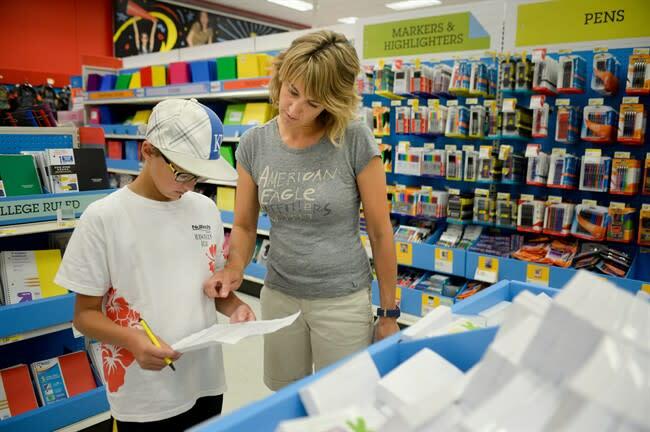 BMO's latest survey, published in mid-August, found total retail sales are expected to climb another 3.5 to four per cent in the 2014 back-to-school season. For families with kids heading to post-secondary facilities, the average per-child spend is expected to hit $1,121. Nearly all students will be purchasing textbooks (88 per cent), while more than half (58 per cent) will be buying new clothes. Other costs include computers and furniture. Post-secondary spending a new boon for retailers? Benjamin Reitzes, senior economist with BMO Capital Markets, said the increased importance of post-secondary education has created a growing market for retailers. “This trend is expected to continue as the focus on higher education will only sharpen in the years ahead," he said in a media release. Peter Lewis agrees university has never been more important to help children succeed professionally. But that just makes the need to save even more vital. Post-secondary education has never been more costly in Canada, with university tuition running at $5,772 on average, according to Statistics Canada. Lewis recommends parents begin to now to tuck away whatever they can afford to ease the financial burden in the future. “I have families who are saving $10 a month,” he said. And while that amount may not seem like much, it adds up. “Every single dollar you set aside is a dollar you are not going to have to find when they (the kids) are ready to go,” Lewis said.